This book is not an attempt to dismiss legitimate criticisms of Muslims. I recognize that for those most skeptical of the study of Islamophobia, such an enterprise comes across as a blatant attempt to ignore all of the problems that exist in Muslim communities inside and outside the West. Islamophobia skeptics often ask the same questions to make their point: Aren’t many of the people committing violence in the name of religion Muslims? Don’t women in many Muslim-majority countries have restricted freedoms and rights? Isn’t it true that many Muslims hold anti-Western or anti-American sentiments? And if the answer to all of these questions is yes, then doesn’t it seem like a fear of Islam is more than justified? These questions sound so simple and are often asked rhetorically. The answer to each question is supposed to be an obvious yes. But when we dig beneath the rhetorical questions and wrestle with the underlying issues, we quickly discover that there are more profound questions we must ask, questions that require considerable self- examination from the non-Muslim majority in the West. To take one example—the issue of violence: Why do a small minority of Muslims commit violence against civilians in the name of Islam? Why are their efforts increasingly aimed at the West, and why now? If the Qur’an or something inherent to Islam supposedly makes them commit this violence, why aren’t the majority of Muslims following suit? What do we make of the fact that the overwhelming majority of the victims of Muslim terrorism are other Muslims? And is it possible that the roots of what is called “Islamic terrorism” are found in historical and political conditions that include European colonialism and Western intervention in Middle Eastern countries and governments? Conversely, why are Muslims constructed as violent whereas Western governments that carry out extensive military actions in Muslim-majority countries are considered peaceful? Why is the killing of innocent Muslims by US drone attacks in Pakistan not an act of terrorism, but the killing of innocent Americans by Muslim extremists is? What does the United States’ history of supporting regimes that practice torture, from pre-revolutionary Iran to Jorge Videla’s Argentina in the late 1970s to Egypt’s current military dictatorship, say about its commitment to peace and human dignity? What does the United States’ own practice of torture in the War on Terror, a practice supported by a majority of white Christian Americans, say about its dedication to human rights? When we wrestle with these types of questions, the answers become more complex and easy assumptions about “violent” Muslims versus the “peaceful” West dissipate quickly. However, wrestling with these questions does not prevent us from criticizing or condemning the violence carried out by some Muslim extremist groups. We can analyze the problem of Islamophobia and critique Muslim individuals or groups when appropriate. Todd Green has written a compelling and important book. The future of the West rises and falls on its ability to welcome the contributions of its most diverse elements. Thus, Islamophobia doesn’t just hurt Muslims, it weakens Western civilization. Professor Green’s book helps us understand the problem and generate creative solutions. This is an outstanding presentation of the history and current state of Islamophobia. 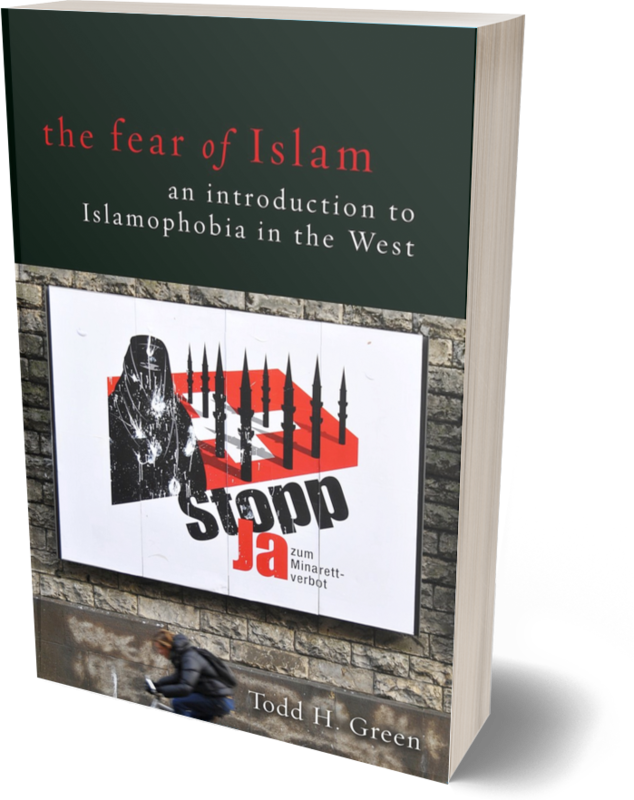 Todd Green draws upon reliable studies supplemented by original research to demonstrate how perceptions of Muslims are shaped and distorted, leading to prejudice and fear. Highly recommended for reporters, teachers, and policy makers. Tragically, the ongoing conflicts in many areas of the world seem likely to continue to generate more reports of violence and to reinforce negative attitudes toward Muslims and Islam. Amid this challenge, Green offers a helpful, wide-ranging analysis of major developments together with thoughtful proposals for transforming attitudes and behaviors. This is an extremely important new book. Muslims and Christians together make up well over half of the world’s population. Without peace and justice between these two religious communities, there can be no meaningful peace in the world. Our future depends on finding a different way of relating. To this end, the author summarizes encyclopedic information, interprets it clearly, and provides insights that point to a new direction. Exceptionally well written, organized and presented, The Fear of Islam: An Introduction to Islamopliobia in the West is as informed and informative as it is thoughtful and thought-provoking.